Julia O’Brien is a practical woman. 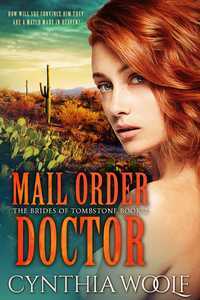 A nurse and midwife, she was perhaps the most surprised when she fell in love with Dr. Matthew Reynolds and agreed to be his mail order bride. She sets off for Tombstone carrying his letters and a heart full of hope. Dr. Matthew Reynolds didn’t want a wife, and is shocked when Julia arrives on his door step with a marriage license bearing his signature. He discovers that his grandfather has wooed the young woman without his knowledge, and made promises in his name without permission. An annulment seems to be the easy answer, but Julia has nowhere to go. Now, his unwanted wife is sleeping in his house, working with him at his clinic, and generally driving him to distraction. When a call comes in from a desperate young mother, Julia handles the call alone. The young woman gives birth to a beautiful baby girl, but does not survive childbirth. Suddenly, Matthew is faced with a new choice, not only does he have a beautiful and caring wife, but a precious new daughter to fill his empty life. But Julia is not willing to accept less than his whole heart, and when the young infant’s father attempts to steal her away, Matthew will have to move heaven and earth to convince the woman he has grown to love that he can be what she needs.